The St. Louis Browns have hired a professional psychologist for the spring training season to currycomb their inferiority complex. 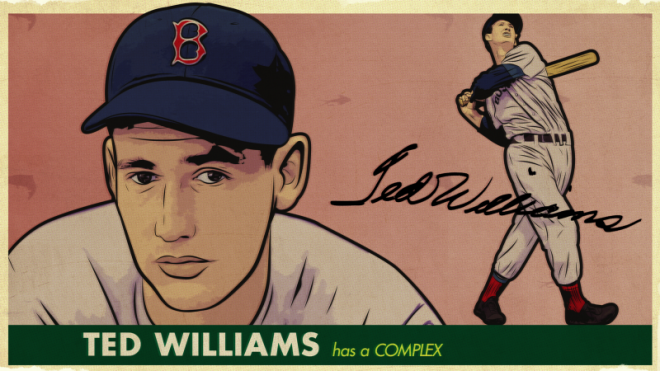 The Boston Red Sox, on the other hand, have chosen a simpler way of treating their own psychological problem, who goes by the name of Theodore S. Williams. I am taking the word of certain experts for it that Williams has, or is, a psychological problem. Around the American League the pitchers tell you that if anything is wrong with Williams, they can only pray that it’s not catching. Give three or four other batsmen Theodore’s disease and the pitching profession will be totally wrecked. However, as I say, many students of human mentality (most of them play the same instrument that I do, the typewriter, and have learned psychology by close observation of the bartender at the water hole around the corner from the office) have been saying for years that Mr. Williams has a complex. They watch him with honest pity as he gropes his way through the shadowland between .340 and .406. They agree with a sigh that he is the strongest left-hand-hitting neurotic they have ever seen. A few weeks ago Thomas A. Yawkey, the Red Sox owner, took cognizance of Ted’s condition and tried the cure I spoke of above. It is a form of shock treatment. The subject is pelted softly but firmly with handfuls of green banknotes in large denominations. The size of the dose varies with the individual. Mr. Yawkey might still be showering his patient with engravings of General Grant had not Williams, rising from the couch when the total reached $125,000, remarked, by way of small talk, that he was satisfied. Your correspondent inspected the convalescent athlete the other day. Mr. Williams was tying trout flies beside an indoor tank containing trout, all members of Actors Esquity. Nearby stood a mermaid, wooing germs in a new-model bathing suit. Next to her was a gentleman who wrestles alligators, and next to him was an alligator, named Strangler Mississippiensis, formerly the catch-as-catch-can champion of the Everglades. I say formerly, for the reptile had been losing straight falls to the wrestler every day that week. It was absolutely clear by then that an alligator is no match for a human being under water. In a tank of orange juice it might be different. I throw out the suggestion for what it’s worth. The scene was the National Sportsmen’s Show, where Mr. Williams tied and cast flies to tune up his arm for the baseball training season. In the circumstances he was not only the highest-paid ballplayer in the world, but the highest-paid flycaster, and I watched the results with interest. If you have never seen professional trout at work, you have a treat in store. Many of these fellows have been playing melodrama since the old Ten-Twenty-Thirty days, and some, as I understand it, have trouped in vaudeville. They do not actually wear fur-collared overcoats and carry sticks, but you can see that they are fish with a flair. The trout defense against Williams, judging by early indications, is the direct reverse of the Boundreau defense, in which the players shift to the right. Williams pulls a baseball to the right. He has a tendency to pull a trout fly in the same direction, and that is the explanation of the trout’s strategy. As Williams begins his cast, the trout shift in unison to the left, like a Ziegfeld chorus line. I suspect that in an open stream, with no holds barred, this would not get them anywhere, but indoors, being a performer himself, Williams shows a happy tolerance for the right of Equity trout. “Live and let live is my slogan,” he states. I regret to say that the policy does not apply to pitchers, nor will it apply to trout after Mr. Williams has hooked his fill of pitchers and called it a career. His ambition, he says, is to fish every lake, stream, and river in the world when he quits baseball. I advise the trout to start warming up three or four left-handers in the bullpen now. This story is collected in The John Lardner Reader: A Press Box Legend’s Classic Sportswriting.